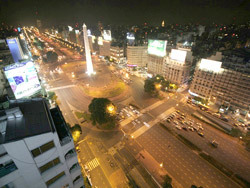 Buenos Aires is a city that combines Latin passion with European elegance. This is a city like no other, where the fiery tango is danced in streets lined with European-style architecture and where one of the world’s most animated live theatre scenes rubs shoulders with more bookshops and libraries than any other city in Latin America. Buenos Aires is a city of innumerable contrasts and these not only highlight its vivacity, but also its intriguing history. This is a spectacular city and a fantastic choice for your Spanish course! Outside of the classroom, you will have many opportunities to practice your Spanish with the friendly Porteños, whether you are browsing one of the bustling markets, discovering the city’s variety of cuisines in one of the many excellent restaurants, or sipping cocktails in Palermo’s trendy bars. The Spanish you learn here will allow you to converse with any Spanish-speaker. As you may already have seen, we have three Spanish schools in Buenos Aires. We offer these three different schools because this is such a popular location amongst our students and due to each school offering different course and accommodation options for you to choose from. Because we select the schools that we work with very carefully, you can be sure that whichever school you choose you will be taught by highly qualified, native Spanish-speaking teachers, who are very experienced in teaching students of all levels. The courses are all total immersion courses and so will be taught in Spanish from the outset. You will also be placed in a group with students of a similar level to yourself. Therefore, there really is nothing to separate our schools in Buenos Aires in terms of professionalism and quality of teaching. Ideally located between Plaza de Mayo and Plaza de la Republica, our school is within easy reach of many of Buenos Aires’ most important landmarks, including the Obelisk, Avenida 9 de Julio, Teatro Colon, Puerto Madero and, of course, Plaza de Mayo itself. This makes it the perfect base from which to explore the city. This school offers some of the best facilities for students in South America, with fully-equipped classrooms, wireless Internet throughout, student lounges and study rooms, a snack area, air conditioning and central heating. This school also offers disabled access. The dynamic atmosphere created when you are placed in a small group (with a maximum of 12 students) with those of a similar level to yourself will help you to quickly get to grips with Spanish. The ‘Intensive’ course of 20 group lessons does tend to prove the most popular as it will allow you plenty of time to explore the city, although if you are taking the course for a shorter duration then you may like to consider the ‘Super-Intensive’ course of 30 lessons per week. Private lessons are the perfect choice if you wish to focus on anything specific in your lessons. We normally offer 10 or 20 private lessons per week as standard in this location, but if you would like to take a different number of lessons, please do not hesitate to contact us for a quote. If you are preparing to take the DELE exam, you should consider the DELE preparation course. This is a course of 10 private lessons per week which will improve your Spanish further, whilst specifically focusing on the skills required to pass the exam. We also cater to those who require Spanish for business reasons. This course consists of 10 private lessons focusing on the Spanish required in professional situations. Finally, why not combine your Spanish course with some tango lessons, to get a real taste of Argentina? You will have one group and one private tango lesson per week (taught in Spanish) and these lessons are suitable for dancers of all levels (including complete beginners). If you require accommodation whilst studying at our school in Buenos Aires, we are sure to offer an option that suits you! 'Host family accommodation is usually a really popular option amongst all of our students, as it is really enriching being able to live with locals and experience the culture first-hand. Linguistically, there is no better option than staying with a host family, as it really does provide invaluable opportunities to practice speaking Spanish outside of the classroom. Host families are typically located within 20-40 minutes from the school by public transport. This accommodation option is offered on a half board basis. Host family 'plus' accommodation which includes a private bathroom is also available on request. Alternatively, you may wish to have a little more independence and be able to prepare your own meals. In this case, you may like to consider shared apartment accommodation (which you would share with the local owner), or student residence accommodation where you would be sharing with local and international students. Again, the travelling time to the school is usually 20-40 minutes by public transport. Part of taking a Spanish course in Buenos Aires is having the opportunity to explore the city, better understand the local culture and, of course, to use your new-found Spanish skills in everyday situations. It is partly for this reason that the school offers an optional activities programme which is open to all students. This is also the perfect way to meet your fellow students and to make friends from all over the world. Examples of typical activities offered include city tours, mate tasting, Spanish film screenings, Milonga nights, tango lessons and excursions to places such as Colonia in Uruguay. You will be informed of the exact activities offered during your stay upon your arrival and, whilst some activities may be free, others may incur a small additional charge payable directly to the school. Our colleagues in Buenos Aires recommend that you book an airport transfer on arrival as this is the easiest and safest way to travel to your accommodation. Please note that this service will incur an additional charge; please contact us for further information. Average score for our school in Buenos Aires (Plaza de Mayo) based on 4 previous client reviews. The teachers were phenomenal! Even after the course ended and I was leaving several gave me their personal emails in case I had any questions or needed activities to give to my students! My host family were amazing! They were kind, helpful and attentive! I had never eaten as good as I did with any host family I ever stayed with! When I go back to Buenos Aires, I am definitely stating with them! Teachers at [the school in Buenos Aires] were phenomenal! I would definitely go back in a heartbeat! The family was amazing! I ate like a king! If I go back, I would definitely be staying with the same family! 4 weeks was too short! My course was awesome! We had a motivated and funny professor, who made it comfortable and easy to learn! All memebers of the school were friendly and open minded and the atmosphere in general was like this as well! !